Amazon has done it again this year: Almost one-third of total ecommerce sales over Cyber Monday in the USA took place on Amazon. Although Amazon’s total share of sales over the heavy holiday shopping weekend is down slightly compared to the previous year, the total amount of sales in 2016 was larger than last year – and Amazon is still in 2016 by far the largest retailer online. The second-largest online sales were pulled in by Best Buy, totalling a meager 7% share of the weekend’s ecommerce sales that pales in comparison to Amazon’s nearly 31%. As many sellers are aware, the ecommerce industry is rapidly changing as it’s growing. Here are a few insights that sellers should already be considering if they want to stay on top of the ecommerce revolution – and at the top of the SERPs of the largest online retailer. Many consumers will continue to go to brick-and-mortar stores for shopping – but store owners should no longer consider an Amazon listing to be ‘optional’. 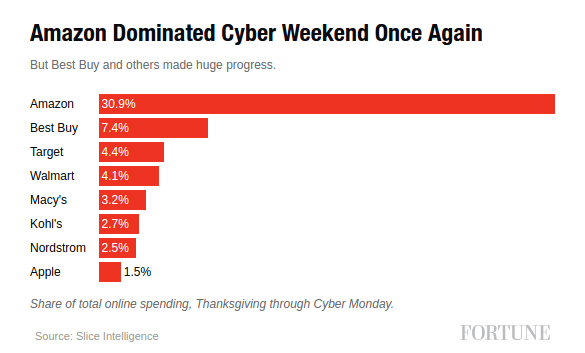 Significantly more Americans shopped online rather than in stores over Black Friday weekend (excluding Cyber Monday). 108.5 million Americans chose online while 99 million went to stores (see sources below). Especially if the weather is bad, the number of online shoppers will only increase. Given that Amazon is by far the largest online retailer in the USA, more and more brick-and-mortar stores should be listing their items on Amazon, too. According to this report, 38.5% of sales on Cyber Monday were driven by search ads. Staying ahead of your competitors is simple logic: Amazon is the largest ecommerce platform in the USA, and a substantial chunk of ecommerce happens through Pay Per Click ads. The added benefit of Amazon PPC ads? The more sales you generate through paid search, the higher your product will rank organically. Note: If you’re not familiar with Amazon ads, check out our Complete Guide to Amazon PPC or browse through the articles here in our blog. Black Friday this year was the first day in American history where mobile sales surpassed one billion Dollars in a single day. Amazon is foraging ahead into new frontiers with Amazon Echo and other devices meant to make online consumption faster and more convenient than before. Preparing your business for mobile consumption doesn’t mean simply having a mobile-optimized landing page or website anymore. Make use of location-based marketing and other mobile-focused approaches to shopping. Who Needs Cyber Monday When There Are Prime Days? A great man once said: Everything is relative. Amazon performed exceedingly well over the heavy holiday shopping weekend and Cyber Monday week, but it’s very important to keep in mind that Amazon can create its own heavy-shopping holiday: Prime Days. It’s quite significant that Amazon has enough weight as an ecommerce platform to select a random low-traffic shopping day in mid-Summer and transform it into such a shopping frenzy that they generate roughtly half of the sales volume they see on the most infamous online shopping day of the year, Cyber Monday. Given Amazon’s track record of continually outperforming itself year over year, one can only expect Prime days to become larger and larger until they can be substantially compared to the size of sales seen on Cyber Monday. Make sure you stay on top of the latest Amazon updates and marketing strategies by signing up to the Sellics newsletter.